"St. Ambrose" redirects here. For the university, see St. Ambrose University. For other uses, see Ambrose (disambiguation). Not to be confused with Ambrosius Aurelianus, a Romano-British war leader. Aurelius Ambrosius[a] (c. 340–397), better known in English as Ambrose (/ˈæmbroʊz/), was a bishop of Milan who became one of the most influential ecclesiastical figures of the 4th century. He was the Roman governor of Liguria and Emilia, headquartered in Milan, before being made bishop of Milan by popular acclamation in 374. Ambrose was a staunch opponent of Arianism. Traditionally, Ambrose is credited with promoting "antiphonal chant", a style of chanting in which one side of the choir responds alternately to the other, as well as with composing Veni redemptor gentium, an Advent hymn. Ambrose was born into a Roman Christian family about 340 and was raised in Gallia Belgica, the capital of which was Augusta Treverorum. His father is sometimes identified with Aurelius Ambrosius, a praetorian prefect of Gaul; but some scholars identify his father as an official named Uranius who received an imperial constitution dated 3 February 339 (addressed in a brief extract from one of the three emperors ruling in 339, Constantine II, Constantius II, or Constans, in the Codex Theodosianus, book XI.5). His mother was a woman of intellect and piety and a member of the Roman family, Aurelii Symmachi and thus Ambrose was cousin of the orator Quintus Aurelius Symmachus. He was the youngest of three children, who included Marcellina and Satyrus (who is the subject of Ambrose's De excessu fratris Satyri), also venerated as saints. There is a legend that as an infant, a swarm of bees settled on his face while he lay in his cradle, leaving behind a drop of honey. His father considered this a sign of his future eloquence and honeyed tongue. For this reason, bees and beehives often appear in the saint's symbology. After the early death of his father, Ambrose went to Rome, where he studied literature, law, and rhetoric. He then followed in his father's footsteps and entered public service. Praetorian Prefect Sextus Claudius Petronius Probus first gave him a place in the council and then in about 372 made him governor of Liguria and Emilia, with headquarters at Milan. In 286 Diocletian had moved the capital of the Western Roman Empire from Rome to Mediolanum (Milan). Ambrose was the Governor of Aemilia-Liguria in northern Italy until 374, when he became the Bishop of Milan. He was a very popular political figure, and since he was the Governor in the effective capital in the Roman West, he was a recognizable figure in the court of Valentinian I. In the late 4th century there was a deep conflict in the diocese of Milan between the Nicene Church and Arians. In 374 the bishop of Milan, Auxentius, an Arian, died, and the Arians challenged the succession. Ambrose went to the church where the election was to take place, to prevent an uproar, which was probable in this crisis. His address was interrupted by a call, "Ambrose, bishop! ", which was taken up by the whole assembly. Ambrose was known to be Nicene Christian in belief, but also acceptable to Arians due to the charity shown in theological matters in this regard. At first he energetically refused the office, for which he was in no way prepared: Ambrose was neither baptized nor formally trained in theology. Upon his appointment, Ambrose fled to a colleague's home seeking to hide. Upon receiving a letter from the Emperor Gratian praising the appropriateness of Rome appointing individuals evidently worthy of holy positions, Ambrose's host gave him up. Within a week, he was baptized, ordained and duly consecrated bishop of Milan. As bishop, he immediately adopted an ascetic lifestyle, apportioned his money to the poor, donating all of his land, making only provision for his sister Marcellina (who had become a nun). This raised his popularity even further, giving him considerable political leverage over even the emperor. Upon the unexpected appointment of Ambrose to the episcopate, his brother Satyrus resigned a prefecture in order to move to Milan, where he took over managing the family's affairs. Statue of Saint Ambrose with a scourge in Museo del Duomo, Milan. Unknown Lombard author, early 17 century. Ambrose studied theology with Simplician, a presbyter of Rome. Using his excellent knowledge of Greek, which was then rare in the West, to his advantage, he studied the Old Testament and Greek authors like Philo, Origen, Athanasius, and Basil of Caesarea, with whom he was also exchanging letters. He applied this knowledge as preacher, concentrating especially on exegesis of the Old Testament, and his rhetorical abilities impressed Augustine of Hippo, who hitherto had thought poorly of Christian preachers. In the confrontation with Arians, Ambrose sought to theologically refute their propositions, which were contrary to the Nicene creed and thus to the officially defined orthodoxy. The Arians appealed to many high level leaders and clergy in both the Western and Eastern empires. Although the western Emperor Gratian supported orthodoxy, the younger Valentinian II, who became his colleague in the Empire, adhered to the Arian creed. Ambrose did not sway the young prince's position. In the East, Emperor Theodosius I likewise professed the Nicene creed; but there were many adherents of Arianism throughout his dominions, especially among the higher clergy. In this contested state of religious opinion, two leaders of the Arians, bishops Palladius of Ratiaria and Secundianus of Singidunum, confident of numbers, prevailed upon Gratian to call a general council from all parts of the empire. This request appeared so equitable that he complied without hesitation. However, Ambrose feared the consequences and prevailed upon the emperor to have the matter determined by a council of the Western bishops. Accordingly, a synod composed of thirty-two bishops was held at Aquileia in the year 381. Ambrose was elected president and Palladius, being called upon to defend his opinions, declined. A vote was then taken, when Palladius and his associate Secundianus were deposed from their episcopal offices. Nevertheless, the increasing strength of the Arians proved a formidable task for Ambrose. In 385 or 386 the emperor and his mother Justina, along with a considerable number of clergy and laity, especially military, professed Arianism. They demanded two churches in Milan, one in the city (the Basilica of the Apostles), the other in the suburbs (St Victor's), be allocated to the Arians. Ambrose refused and was required to answer for his conduct before the council. [page needed] He went, his eloquence in defense of the Church reportedly overawing the ministers of Valentinian, so he was permitted to retire without making the surrender of the churches. The day following, when he was performing divine service in the basilica, the prefect of the city came to persuade him to give up at least the Portian basilica in the suburbs. As he still refused, certain deans or officers of the court were sent to take possession of the Portian basilica, by hanging up in it imperial escutcheons to prepare for the arrival of the emperor and his mother at the ensuing festival of Easter. In spite of Imperial opposition, Ambrose declared, "If you demand my person, I am ready to submit: carry me to prison or to death, I will not resist; but I will never betray the church of Christ. I will not call upon the people to succour me; I will die at the foot of the altar rather than desert it. The tumult of the people I will not encourage: but God alone can appease it." A second later embassy was unsuccessful. The enemy entered Italy and Milan was taken. Justina and her son fled but Ambrose remained at his post and did good service to many of the sufferers by causing the plate of the church to be melted for their relief. Theodosius I, the emperor of the East, espoused the cause of Justina, and regained the kingdom. Theodosius was excommunicated by Ambrose for the massacre of 7,000 people at Thessalonica in 390, after the murder of the Roman governor there by rioters. [page needed] Ambrose told Theodosius to imitate David in his repentance as he had imitated him in guilt – Ambrose readmitted the emperor to the Eucharist only after several months of penance. This shows the strong position of a bishop in the Western part of the empire, even when facing a strong emperor – the controversy of John Chrysostom with a much weaker emperor a few years later in Constantinople led to a crushing defeat of the bishop. In 392, after the death of Valentinian II and the fall of Eugenius, Ambrose supplicated the emperor for the pardon of those who had supported Eugenius after Theodosius was eventually victorious. In his treatise on Abraham, Ambrose warns against intermarriage with pagans, Jews, or heretics. In 388, Emperor Theodosius the Great was informed that a crowd of Christians, led by their bishop, had destroyed the synagogue at Callinicum on the Euphrates, in retaliation for the burning of their church by the Jews. He ordered the synagogue rebuilt at the expense of the bishop, but Ambrose persuaded Theodosius to retreat from this position. He wrote to the Emperor, pointing out that he was thereby "exposing the bishop to the danger of either acting against the truth or of death"; in the letter "the reasons given for the imperial rescript are met, especially by the plea that the Jews had burnt many churches". In the course of the letter Ambrose speaks of the clemency that the emperor had shown with regard to the many houses of wealthy people and churches that had been destroyed by unruly mobs, with many then still not restored and then adds: "There is, then, no adequate cause for such a commotion, that the people should be so severely punished for the burning of a building, and much less since it is the burning of a synagogue, a home of unbelief, a house of impiety, a receptacle of folly, which God Himself has condemned. For thus we read, where the Lord our God speaks by the mouth of the prophet Jeremiah: 'And I will do to this house, which is called by My Name, wherein ye trust, and to the place which I gave to you and to your fathers, as I have done to Shiloh, and I will cast you forth from My sight, as I cast forth your brethren, the whole seed of Ephraim. And do not thou pray for that people, and do not thou ask mercy for them, and do not come near Me on their behalf, for I will not hear thee. Or seest thou not what they do in the cities of Judah?' God forbids intercession to be made for those." Yet, Ambrose did not oppose punishing those who were directly responsible for destroying the synagogue. In his exposition of Psalm 1, Ambrose says: "Virtues without faith are leaves, flourishing in appearance, but unproductive. How many pagans have mercy and sobriety but no fruit, because they do not attain their purpose! The leaves speedily fall at the wind's breath. Some Jews exhibit purity of life and much diligence and love of study, but bear no fruit and live like leaves." Under his influence, emperors Gratian, Valentinian II and Theodosius I carried on a persecution of Paganism; Theodosius issued the 391 "Theodosian decrees," which with increasing intensity outlawed Pagan practices. The Altar of Victory was removed by Gratian. Ambrose prevailed upon Gratian, Valentinian and Theodosius to reject requests to restore the Altar. In April 393 Arbogast, magister militum of the West and his puppet Emperor Eugenius marched into Italy to consolidate their position in regard to Theodosius I and his son, Honorius, whom Theodosius had appointed Augustus to govern the western portion of the empire. Arbogast and Eugenius courted Ambrose's support by very obliging letters; but before they arrived at Milan, he had retired to Bologna, where he assisted at the translation of the relics of Saints Vitalis and Agricola. From there he went to Florence, where he remained until Eugenius withdrew from Milan to meet Theodosius in the Battle of the Frigidus in early September 394. Soon after acquiring the undisputed possession of the Roman Empire, Theodosius died at Milan in 395, and two years later (4 April 397) Ambrose also died. He was succeeded as bishop of Milan by Simplician. 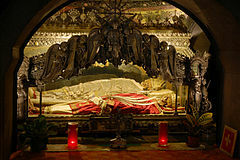 Ambrose's body may still be viewed in the church of Saint Ambrogio in Milan, where it has been continuously venerated – along with the bodies identified in his time as being those of Saints Gervase and Protase. It was his custom to comment severely in his preaching on the public characters of his times; and he introduced popular reforms in the order and manner of public worship. It is alleged, too, that at a time when the influence of Ambrose required vigorous support, he was admonished in a dream to search for, and found under the pavement of the church, the remains of two martyrs, Gervasius and Protasius. The saints, although they would have had to have been hundreds of years old, looked as if they had just died. The applause of the people was mingled with the derision of the court party. Ambrose ranks with Augustine, Jerome, and Gregory the Great, as one of the Latin Doctors of the Church. Theologians compare him with Hilary, who they claim fell short of Ambrose's administrative excellence but demonstrated greater theological ability. He succeeded as a theologian despite his juridical training and his comparatively late handling of Biblical and doctrinal subjects. One could interpret this passage as being another example of the mainstream Christian belief in a general resurrection (both for those in heaven and for those in hell). Several other works by Ambrose clearly teach the mainstream view of salvation. For example: "The Jews feared to believe in manhood taken up into God, and therefore have lost the grace of redemption, because they reject that on which salvation depends." He was also interested in the condition of contemporary Italian society. Ambrose considered the poor not a distinct group of outsiders, but a part of the united, solidary people. Giving to the poor was not to be considered an act of generosity towards the fringes of society but a repayment of resources that God had originally bestowed on everyone equally and that the rich had usurped. The theological treatises of Ambrose of Milan would come to influence Popes Damasus, Siricius and Leo XIII. Central to Ambrose is the virginity of Mary and her role as Mother of God. Christ is not divided but one. If we adore him as the Son of God, we do not deny his birth from the virgin... But nobody shall extend this to Mary. Mary was the temple of God but not God in the temple. Therefore, only the one who was in the temple can be worshipped. Ambrose viewed celibacy as superior to marriage and saw Mary as the model of virginity. A collection of hymns on the Creation of the Universe. Stained-glass window by Sergio de Castro based on the Ambrosian hymns about the Creation of the universe, Church of the Benedictines at Couvrechef – La Folie (Caen), 1956–59. Detail of the Seventh Day of Creation: divine rest with the Ambrosian hymns. Saint Ambrose in His Study, c. 1500. Spanish, Palencia. Wood with traces of polychromy. Metropolitan Museum of Art, New York City. Ambrose is traditionally credited but not actually known to have composed any of the repertory of Ambrosian chant also known simply as "antiphonal chant", a method of chanting where one side of the choir alternately responds to the other. (The later pope Saint Gregory I the Great is not known to have composed any Gregorian chant, the plainsong or "Romish chant".) However, Ambrosian chant was named in his honor due to his contributions to the music of the Church; he is credited with introducing hymnody from the Eastern Church into the West. Catching the impulse from Hilary of Arles and confirmed in it by the success of Arian psalmody, Ambrose composed several original hymns as well, four of which still survive, along with music which may not have changed too much from the original melodies. Each of these hymns has eight four-line stanzas and is written in strict iambic tetrameter (that is 4 x 2 syllables, each iamb being two syllables). Marked by dignified simplicity, they served as a fruitful model for later times. 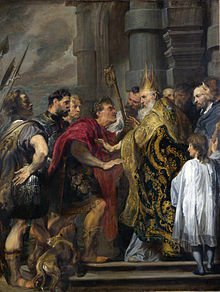 Saint Ambrose was also traditionally credited with composing the hymn "Te Deum", which he is said to have composed when he baptised Saint Augustine of Hippo, his celebrated convert. Ambrose was Bishop of Milan at the time of Augustine's conversion, and is mentioned in Augustine's Confessions. It is commonly understood in the Christian Tradition that Ambrose baptized Augustine. In a passage of Augustine's Confessions in which Augustine wonders why he could not share his burden with Ambrose, he comments: "Ambrose himself I esteemed a happy man, as the world counted happiness, because great personages held him in honor. Only his celibacy appeared to me a painful burden." This is a celebrated passage in modern scholarly discussion. The practice of reading to oneself without vocalizing the text was less common in antiquity than it has since become. In a culture that set a high value on oratory and public performances of all kinds, in which the production of books was very labor-intensive, the majority of the population was illiterate, and where those with the leisure to enjoy literary works also had slaves to read for them, written texts were more likely to be seen as scripts for recitation than as vehicles of silent reflection. However, there is also evidence that silent reading did occur in antiquity and that it was not generally regarded as unusual. ^ Italian: Sant'Ambrogio [ˌsantamˈbrɔːdʒo]; Lombard: Sant'Ambroeus [ˌsãːtãˈbrøːs]. ^ a b c d e f Attwater & John 1993. ^ a b Loughlin, James. "St. Ambrose." The Catholic Encyclopedia Vol. 1. New York: Robert Appleton Company, 1907. ^ Paredi & Costelloe 1964, p. 380: "S. Paulinus in Vit. Ambr. 3 has the following: posito in administratione praefecturae Galliarum patre eius Ambrosio natus est Ambrosius. From this, practically all of Ambrose's biographers have concluded that Ambrose's father was praetorian prefect in Gaul. This is the only evidence we have, however, that there ever was an Ambrose as prefect in Gaul." ^ Barnes, T. D., "The Election of Ambrose of Milan", in: Johan Leemans (ed), Episcopal Elections in Late Antiquity, de Gruyter, 2011, pp. 39–60. ^ Mazzarino, S. "Il padre di Ambrogio", Helikon 13–14, 1973–1974, 111–117. ^ Mazzarino, S., "Storia sociale del vescovo Ambrogio", Problemi e ricerche di storia antica 4, Rome 1989, 79–81. ^ a b c d Grieve 1911, p. 798. ^ Leemans, Johan; Nuffelen, Peter Van; Keough, Shawn W.J. ; Nicolaye, Carla (2011). Episcopal Elections in Late Antiquity. Walter de Gruyter. ISBN 978-3110268607. ^ a b Butler 1991, p. 407. ^ a b c d Butler 1991, p. 408. ^ a b c d e f g h i j k l m n o Grieve 1911, p. 799. ^ "Council of Centers on Jewish–Christian Relations, "Ambrose of Milan, 'Letters about a Synagogue Burning' (August 388)"". Archived from the original on 27 September 2013. Retrieved 24 September 2013. ^ Byfield (2003) pp. 92–94: 'In the west, such [anti-Pagan] tendencies were less pronounced, although they had one especially powerful advocate. No one was more determined to destroy paganism than Ambrose, bishop of Milan, a major influence upon both Gratian and Valentinian II. [p. 94] The man who ruled the ruler – Whether Ambrose, the senator-bureaucrat-turned-bishop, was Theodosius's mentor or his autocrat, the emperor heeded him – as did most of the fourth-century church'. ^ Ambrose (1907), "Exposition of the Christian Faith, Book III", The Catholic Encyclopedia, New York: Robert Appleton Co, retrieved February 24, 2009 from New Advent. ^ About his concern of society see Maciej Wojcieszak, Obraz społeczeństwa Italii w listach Ambrożego z Mediolanu, "Christianitas Antiqua" 6 (2014), s. 177–187. ISSN 1730-3788. ^ Brown, Peter (2012). Through the Eye of the Needle – Wealth, the Fall of Rome, and the Making of Christianity in the West, 350–550 AD. Princeton University Press. p. 133. ^ Tierney, Brian; Painter, Sidney (1978). "The Christian Church". Western Europe in the Middle Ages, 300–1475 (3rd ed.). New York, NY: Alfred A Knopf. p. 35. ISBN 978-0-394-32180-6. ^ Fenton, James (July 28, 2006). "Read my lips". The Guardian. London. Attwater, Donald; John, Catherine Rachel (1993), The Penguin Dictionary of Saints (3rd ed. ), New York: Penguin Books, ISBN 978-0-14-051312-7 . Butler (1991), Walsh, Michael, ed., Lives of the Saints, New York: HarperCollins Publishers . Deferrari, Roy J., ed. (1954–72), The Fathers of the Church, 26, 42, 44, 65, New York: Fathers of the Church . Gilliard, Frank D. (1984), "Senatorial Bishops in the Fourth Century", Harvard Theological Review, 77 (2): 153–175, doi:10.1017/s0017816000014279 . One or more of the preceding sentences incorporates text from a publication now in the public domain: Grieve, Alexander J. (1911). "Ambrose, Saint" . In Chisholm, Hugh. Encyclopædia Britannica. 1 (11th ed.). Cambridge University Press. pp. 798–799. King, N.Q. (1960), The Emperor Theodosius and the Establishment of Christianity, Philadelphia: Westminster Press . McLynn, Neil B. (1994), Ambrose of Milan: Church and Court in a Christian Capital, The Transformation of the Classical Heritage, 22, Berkeley: University of California Press . "Ambrose", Patron Saints Index, SPQN, January 2009, retrieved 2012-12-08 . This article incorporates text from a publication now in the public domain: Herbermann, Charles, ed. (1913). "St. Ambrose" . Catholic Encyclopedia. New York: Robert Appleton. Wikimedia Commons has media related to Ambrose.